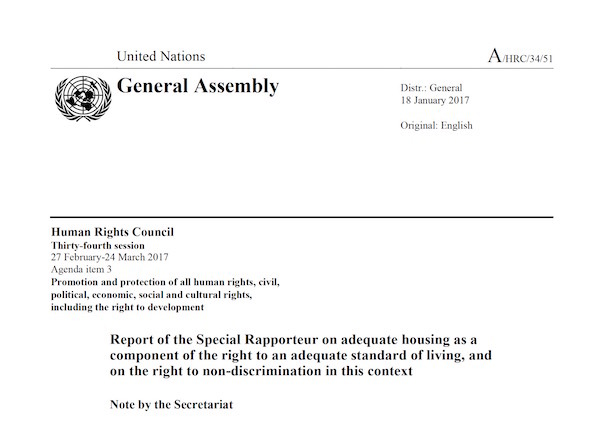 The UN Special Rapporteur’s Report into the financialisation of housing delivers a damning indictment on the worldwide commodification of housing. The report investigates the state of housing globally, the current economic policy trends to control and shape investment, and the efficacy of those policy measures. Finally the report makes a series of key recommendations for governments to address the rising gap between the housing haves and have nots. 30. A significant portion of investor-owned homes are simply left empty. In Melbourne, Australia, for example, 82,000 or one fifth of investor-owned units lie empty. The report looks in detail at trends in bilateral trade deals prioritising investor rights over human rights, of luxury housing over affordable housing and the failed outcomes from the bailout of the financial industry post 2008. The UN Special Rapporteur for housing investigates how property investors have responded to the Global Financial Crisis; with an unprecedented acceleration in international property investment. While much has been written about the financialization of housing, it has not often been considered from the standpoint of human rights. States are obliged under international human rights to ensure that private investors respond to the needs of residents for secure, affordable housing and do not cater only to the wealthy or purchase homes simply to leave them empty. One such measure, colloquially known as the “golden visa”, allows foreign investors to receive permanent residence or even citizenship in exchange for a minimum amount of investment in property. Australia has a significant investor visa program for individual foreign investors who purchase $AUD 5 million in real estate through a real estate investment trust. Programs of this nature can contribute to housing affordability problems for local residents without providing any evidence of substantial benefits for the broader population. “The Great Wall of Money” which includes a calculation of the amount of capital raised each year for trans-border real estate investments. The total in 2015 was a record $443 billion, with residential properties representing the largest single share. Many corporate owners of housing are nameless. In the first fiscal quarter of 2015, 58 per cent of all property purchases over $3 million in the United States were made by companies and the majority of which were cash purchases. More than 36,000 properties in London are held by shell companies registered in offshore tax havens. The raising of foreign investment thresholds continues to be a significant pressure point in bi-lateral trade agreements. Governments seek to keep these thresholds low, and with little transparency involved in negotiations, one can only imagine the backroom pressure from vested interests. The most recent trend is for nations to push for a $1 billion real estate investment threshold. For example, if your nation has a bilateral agreement with Australia, any investment under $1.094 billion in developed commercial or agricultural land is not investigated by the Foreign Investment Board. Such nations include: China, Korea, Japan, New Zealand, Chile and the United States. Singapore and Thailand’s agreements have more restrictive foreign investment thresholds of $252 million in commercial and $50 million in agricultural land. Placing restrictions on foreign investment (Austria, China, the Philippines, Thailand and Vietnam). Other states such as Catalonia, Spain are penalising vacant housing with punitive measures including expropriating vacant housing. The report references The Adam Smith Institute’s proposal for greater use of a Property Speculation Tax. Used in countries such as Germany and Taiwan, Property Speculation Taxes impose a high rate of tax if properties are sold quickly. The tax is tapered, with lower rates the longer the property is held. Whilst imaginative, this reform could have the unintended consequence of encouraging the lumpy sale of property. We imagine a scenario where vendors delay selling to avoid higher imposts. Such a charge will do little to ensure the property is actually used for housing, further constricting supply until the penalty time frame passes. The UN Special Rapporteur’s report does not list Land Value Tax as a policy response. However, LVT is by far the fastest and fairest way to reduce the burden property speculation places on communities. Placing a yearly charge on land holding forces it to be used economically. If such land taxes are set at a significant rate relative to average rental costs, owners are forced to put empty homes to use. This levy delivers a significant revenue stream to government, enabling income and company tax cuts, which in turn encourages production. Financialized housing markets create and thrive on gentrification and the appropriation of public value for private wealth. Improved services, schools or parks in an impoverished neighbourhood attract investment, which then drives residents out. The transformation of an old railway line in West Chelsea in Manhattan into a public walkway and park has attracted wealthy investors to a mixed income neighbourhood, radically transforming it with luxury housing units costing in the multimillions, and displacing longer term residents. Manhattan’s High Line certainly acts as a carrot for luxury apartments to soak up the premium views provided by this new public infrastructure gem. Overlooked in the analysis is the role rent-seeking plays in accelerating the pace of change in communities, the very outcome gentrification identifies. This pace of change can best be slowed with LVT capturing a significant amount of the land value uplift created by publicly funded development. This reduces the incentive to speculate, curbing the rapid price hikes so many communities face. The longer a property is held, the more tax is charged. Empty homes rapidly become uneconomic. Genuine developers building needed housing will still see a good return on investment. Unearned income is another aspect that must be understood to make sense of global property speculation. This is income received for no actual productive activity. The existence of property rights over a scarce resource allows owners to charge higher prices. Property investors chase the easy gains delivered to desirable locations. The report does not quantify the jaw-dropping profits in land price appreciation. As the Bank of International Settlements has noted, the need for a uniform measure for global house (read: land) prices is vital. Accompanying the importance of accurate statistics are concerns about the privatisation of property sales data. In Australia, it costs $6,000 for just one spreadsheet with 487 rows of sales turnover data. With millions of homes in Australia, the data costs entailed in detailed housing affordability analysis rises to more than $250,000. These costs are a significant burden on organisations such as Prosper, who seek to demystify the political-economy of land and housing. The ABS publicly releases a very thin layer of property data at the macro level. Detailed land and house price data has been privatised at great cost to public social science research. In 2017, only the corporate sector and wealthy institutions can analyse property data at a community level. The US administration is planning a $1 trillion infrastructure plan. President Trump, a noted property developer, is well aware that publicly funded infrastructure leads to private windfall gains for neighboring property owners. Games of favouritism will be played out behind closed doors. Such rent-seeking determines which particular location a train station or highway on/ off ramp occurs. Nearby land owners will benefit greatly, most likely selling the site without building any additional housing. The purchasing developer will be forced to increase the price of dwellings to cover this cost. The outcomes of this plan could well be catastrophic for existing communities. But without affordable access to accurate statistics, the damage is hard to quantify. In the context of financialisation, the report talks about Residential Backed Mortgage Securities. It does not mention the role of Wall Street’s latest tool of mass destruction: Rental Backed Mortgage Securities. The corporatisation of the rental market is sweeping through Greece, Spain, Ireland and a number of US cities including LA and Atlanta. The impact has been so significant that the Federal Reserve Bank of Atlanta released a hard-hitting report entitled Corporate Landlords, Institutional Investors, and Displacement: Eviction Rates in Single- Family Rentals. The size and location of single family rental (SFR) purchases is also telling. Many sites are targeted for the large land size, with a plan for multi-density rezoning in some seven years. At this point, well-honed investors may just opt to flip the property without even building. This could well triple the return on the original investment for a few hours paperwork, some patience and of course the capital to begin with. Some SFRs are purchased in adjacent sites to maximise the expected density bonus. Rental Backed Mortgage Securities are set to become very popular as they allow for the raising of cheap capital. Private equity companies like Blackstone Capital have ushered in a new era of corporate landlordism by buying 48,000 single family rental homes in the past six years. Blackstone will soon roll out their holding company Invitation Homes for an IPO estimated at $1.5 billion. The book value of 48,000 homes is estimated at $9.7 billion. Any capital raising over $1.5 billion will send traders into a flurry. Two similar SFR orientated companies – Starwood and Colony Homes – have already secured Wall Street kudos by returning some 22% and 27% last year. In comparison, the S&P500 averaged 7.9%. Many SFR tenants experience high rents. Unfortunately, with ineffective vacancy rates drastically understating genuine vacancies, renters may find themselves locked into higher prices without realising there are dozens of vacant properties in their neighborhood. The increasing corporatisation of our communities is reliant on easy, untaxed economic rents. The visible outcome of this practice are vacant homes and homelessness, alongside gross spatial and socio-economic inequality. We encourage the UN Special Rapporteur’s 2018 report to include a section on the need for a comprehensive vacancy measure. Melbourne, Sydney and many other global cities rely on housing vacancy statistics compiled by the real estate industry itself. Mainstream media regularly quote a vacancy figure calculated by a voluntary survey of real estate agents. Agents have an obvious conflict of interest, as tight supply supports higher prices. We believe there is a downward bias to their vacancy findings. An alternative available vacancy measure looks at the number of properties advertised online over time. Neither measure addresses the increasing role of housing as an investment function. Prosper’s Speculative Vacancy report uses water consumption as a proxy for vacant housing. The average single person dwelling uses 176L of water per day. A leaking tap can drip 29L per day. When a toilet flush or two is added, the expected daily usage rises above the 50L vacancy threshold. With the threshold three times less than a single person’s average water consumption, the 50L threshold is conservatively placed. Prosper’s Speculative Vacancy report offers greater insight by analysing all residential land. However, even this vacancy measure understates the magnitude of the problem. It does not include those land banks on the sprawl of the city which aren’t yet connected to water. Developers typically do not turn on water meters until the ‘point of sale’ contract is accepted. Many sites are slowly drip-fed to the market over fifteen years. If these sprawling vacancies were included, the vacancy totals for Melbourne would be significantly higher than our regular finding of 80,000 empty homes. Prosper Australia would like those concerned about housing commodification to champion a realistic housing vacancy statistic in all their policy advocacy. 39. The financialization of housing has dramatically altered the relationship of States to the housing sector and to those to whom they have human rights obligations. Rather than being held accountable to residents and their need for housing, States’ housing policies have often become accountable to financial institutions and seem to pander to the confidence of global credit markets and the preferences of wealthy private investors. Given the predominance of housing-related credit in many economies, domestic housing policy becomes intertwined with the priorities and strategies of central banks and international financial institutions, which are themselves rarely held accountable to States’ human rights obligations to ensure access to adequate housing and do not meaningfully engage with rights-holders. The UN Special Rapporteur’s report does not list Land Value Tax as a policy response. – sad but typical I suppose. When will it ever change? This [LVT] levy delivers a significant revenue stream to government, enabling income and company tax cuts, which in turn encourages production. – I would rather say, This [LVT] levy delivers a significant revenue stream to government, enabling investment in essential infrastructure, which in turn encourages economic growth, in a virtuous circle. Detailed land and house price data has been privatised at great cost to public social science research. In 2017, only the corporate sector and wealthy institutions can analyse property data at a community level. – this is news to me but pretty stunning. I detest the privatisation racket more and more as time goes on. Now there’s a name I haven’t seen enough of recently! Good to hear from you Bernard. I like your positive spin on the LVT revenue stream. It’s all about growth, meaningful growth.